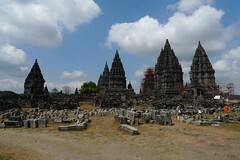 World heritage site Candi Prambanan near Yogyakarta in Central Java is now facing threat from heavy rainfalls on Mt Merapi. Around 100 meters west of the majestic Hindu temple lies Opak River, whose bed may be streamed by Merapi volcanic mudflow. Moreover, Opak River also collides with Gendol River not far from the temple. “Volcanic mudflow may hit Candi Prambanan,” said Dewi Sri Sayudi, a staff at the Volcanology Technology Research and Development Agency of Yogyakarta, today, Jan 11. Downpours on the peak of Mt Merapi will pile Opak River with ashes, sand and rocks. Interesting because just 4 days ago I went to see the lahar in the Gendol River. It was an incredible site, a wide river reduced to a trickle, and clouds of steam blowing around. Houses had been destroyed and many trees were killed. Many bulldozers were working to clear the river.